In an ironic twist, young people who try e-cigs are at a far higher risk of becoming conventional cigarette smokers compared with teens who don’t. Vaping appears to be wildly popular among teens who use e-cigs illegally. And in an ironic twist, teens who try vaping are at a far higher risk of becoming smokers compared with teens who don’t. It comes alongside a new report from the Centres for Disease Control and Prevention which found that roughly four out of five adolescents are exposed to e-cig advertisements. “Based on the existing scientific evidence … e-cigarette use currently represents more population-level harm than benefit,” the Dartmouth researchers wrote in their study. That said, the study is a model – it’s not a controlled study that looks at actual habits, so the findings are somewhat limited. There’s also no way to know, for example, if the e-cig users in the study who went on to smoke conventional cigarettes might have become smokers anyway, although the researchers attempted to control for that in their model. Still, scientists aren’t clear why this is happening. 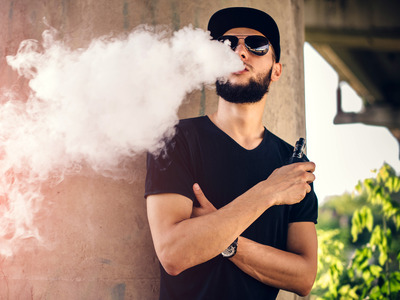 While some have argued that vaping could be linked with a so-called “gateway effect” whereby young people who vape become addicted to nicotine and are thus more likely to transition to traditional cigarettes, others have said this doesn’t make sense. Either way, public health experts are worried about vaping’s growing popularity among young people. Unlike conventional cigarettes, which have a natural stop mechanism – they burn to the end – e-cigs can be re-filled and reused. Additionally, e-cigs are discrete and sometimes odourless (or have a non-offensive smell). Vaping isn’t universally banned in indoor and outdoor places. Many vape pens are sleek, small, colourful, and fairly affordable. “Vaping among teens is my (and most public health professionals) biggest worry,” Rule told Business Insider last month.